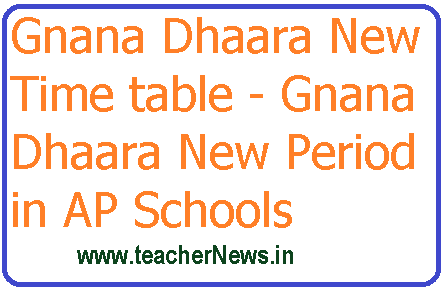 Gnana Dhaara New Time table - Gnana Dhaara New Period in AP Schools : High School New Time Table with additional Gnana Dhaara Period. Upper Primary/ Primary Schools Gnana Dhaara New Time Table. జ్ఞానధార సరికొత్త బోధన 6, 7, 8 తరగతుల విద్యార్థులకు 23 నుంచి కొత్తగా తొమ్మిదో పీరియడ్‌ విధానం. Gnana Dhaara - Learning Enhancement Programme (GD - LEP). AP School Education Department has made an Endeavour to bridge up the learning differences identified among the learners during A.Y 2017-18, especially the C1, C2, D1 and D2 grade low proficient learners. Accordingly, it has launched “Gnana Dhaara” Remediation Programme for Class VI, VII & VIII during the summer vacation in 2018. జ్ఞానధార సరికొత్త బోధన 6, 7, 8 తరగతుల విద్యార్థులకు 23 నుంచి కొత్తగా తొమ్మిదో పీరియడ్‌ విధానం. దసరా సెలవులు అనంతరమే ప్రాథమికోన్నత, ఉన్నత పాఠశాలల్లో ఈ కార్యక్రమాన్ని అమలు చేయాలని విద్యాశాఖ ఆదేశాలు జారీ చేసింది. ఇందులో భాగంగా తెలుగు, ఆంగ్లం, గణితం సబ్జెక్టులను టూ డైమన్షన్‌ విధానంలో బోధిస్తారు. జ్ఞానధార కార్యక్రమం అమలుకు సీ, డీ గ్రేడ్‌ విద్యార్థులకు తెలుగు, గణితం, ఆంగ్లం పాఠ్యాంశాల్లో ప్రాథమిక సామర్థ్యాలను నేర్పిస్తారు. ఇప్పటి వరకు ఎనిమిది పీరియడ్లు అన్ని పాఠశాలల్లో నిర్వహిస్తున్నారు. జ్ఞానధార అమలుకోసం ప్రాథమికోన్నత, ఉన్నత పాఠశాలల్లో తొమ్మిదో పీరియడ్‌ను ప్రవేశపెడుతున్నారు. ఇందుకు ప్రతి పీరియడ్‌ను 50 నిమిషాల నుంచి 45 నిమిషాలకు తగ్గించి ప్రతి పీరియడ్‌కు వచ్చే 5 నిమిషాలను కలిపి 45 నిమిషాలుగా తొమ్మిదో పీరియడ్‌ను పరిగణిస్తారు. జ్ఞానధారకు సంబంధించిన పీరియడ్‌ ఉదయం 2వ పీరియడ్‌ ముగిసిన అనంతరం 3వ పీరియడ్‌లో బోధిస్తారు. పాఠశాల సమయాల్లో ఉదయం 9.45 గంటల నుంచి సాయంత్రం 4.45 గంటల్లో ఎలాంటి మార్పు లేదు. This series has two broad segments, i.e. Class work and Homework. It is a common frame work for all the classes VI, VII & VIII which mainly aims at enriching the much-needed fundamentals of learning the subject. The teacher should ensure that the homework content is assigned to the students on daily basis. The teacher must ensure that the evaluation of the homework content is religiously carried out on the successive days of the remedial programme. This is the heart of effective implementation of the programme as well as achieving its core objective and motto. If need be, a regular remedial session may be utilized at full-length to ensure the evaluation is done in the stipulated time frame. The Homework segment is classified into five broad stages of 30 days each to develop literacy and numeracy from their basics. All the activities are framed and incorporated in such a way that the previous knowledge of the students is tested and to that new concepts are addressed in a simple way making learning a joyful experience while exploring the subject. The activities so designed not only strengthen conceptual learning, but also enable students to identify the practical errors, edit them and correct them on their own. On the other hand, the focus of classwork segment is purely textual – related to integrating all the unit-wise class specific learning outcomes in its totality. The worksheets will play the role of a navigator to introduce the topic succinctly and shall reinforce the learning outcomes substantially. While designing the remedial chapter / unit-wise contents, utmost care has been taken in designing activities that involve students of C1, C2, D1 and D2 grades. The remediation in a way plays the role of a catalyst to enrich above average students in general and boosts up the learning experiences of D1 & D2 remedial seekers in particular. Involving A1, A2 and B1, B2 students are important to promote peer-learning. During GD period, Classes 6 to 8 are engaged by Telugu, English and Mathematics subject teachers. Hence, the H.M should see that 9th and 10th classes are engaged in P.S/ N.S /S.S/ Hindi subjects/ DCR class/ either for completion of syllabus/revision/model tests practice/project works/innovative practices/pre-board preparation activities. If there are more than one subject teacher in the school, subject to the level of possibility, Head Masters should ensure that all subject teachers should work in coordination during and after GD period and ensure that the class is engaged for the purpose. 1. Students progress in academics through GD LEP programme will be assessed by conducting baseline, midline and end line tests during AY 2018-19. The test tools will be provided by SCERT and the evaluation should be done at school level by the corresponding subject teachers. In each district in a sample of schools external evaluation will be taken up to study the impact assessment. New Time table for High schools and UP Schools with Gnana Dhara period - class wise subject wise allotment -class room strategy-Assessments-Gnana Dhaara Learning Enhancement Programme New Time table.